We want your Test Generator experience to be a successful one. Having a good grasp on how TG works and knowing how to navigate in the program will make your test authoring and administration that much easier. This tutorial is intended for customers who have TGScan. The complete TGScan Tutorial can be download here. If you are unable to access the tutorial, please contact us and we will be happy to email it to you. Review the Test Generator Guide to Exam Building Best Practices tutorial and Review TG’s Print Template tutorial. If you have not participated in training, or if you feel there a certain "grey areas" that you need help on, please contact us so that we can schedule an online support or "refresher" training session. 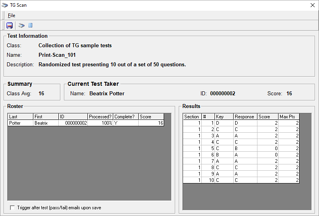 TG Scan is an add-on utility that enables test authors to create, print and distribute paper tests to their test-taking audience: employees, trainees, clients, pre-hires or students. TGScan includes an answer sheet template that test authors can use to print answer sheets--free. 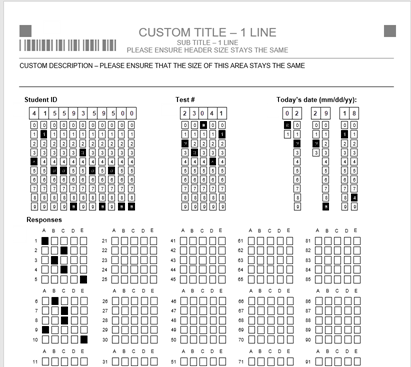 Test takers are provided with a printed test and answer sheet. Once the tests have been completed, the test administrator / proctor collects the printed tests and answer sheets. Download the TGScan tutorial for more information. Once an answer sheet has been successfully scanned in, the t.taker’s results are displayed under the Results table on the right side of the screen.